The President (社長?) is the owner or co-owner of Hocotate Freight, and a playable character in Pikmin 2. Although the President was not seen until Pikmin 2, he was alluded to by Olimar in his daily journal entries in the first game. His name is not known, since he's only ever referred to as "the President", or "the President of Hocotate Freight", and the only known family member is his wife, who occasionally sends messages to him. When he was younger, the President used to live in a small shed. If what he claims is true, he used to be an important name back when he was Louie's age. He runs into financial trouble after Louie, a new employee, shipping a supply of the very valuable Golden Pikpik carrots, is reportedly attacked by a ravenous space bunny who is said to have devoured the entire cargo of carrots. The President takes out a large loan to reimburse the loss of the golden Pikpik carrots, and has no way of repaying the enormous debt. He sells off the only company asset, Captain Olimar's ship, the S.S. Dolphin, in Olimar's absence, but it only makes a small dent in the enormous loan, as × 10,100 are still owed. This, occurring after the events of Pikmin, surprises Captain Olimar who just returned to Hocotate. He is so surprised by the news, in fact, that he drops a souvenir he brought back from his adventure for his son. The souvenir, a bottle cap, is collected by the ship, which then evaluates the item as a treasure and worth × 100, reducing the debt to an even 10,000. The President then orders Olimar and Louie to recover more treasure so that the debt is repaid. During their absence, the President sends periodic letters to the duo. He eventually discovers that the loan came from the All-Devouring Black Hole Loan Sharks instead of Happy Hocotate Savings & Loan, and goes into hiding from the loan company's threats, temporarily living under a bridge, and eating grass to survive. Eventually, he gets caught, and is threatened with death. During the events of Pikmin 2's story, it is revealed that the President is over 50 years old. Assuming The President started working at the company at least after he was 10, he's pobably over 60 years old. Additionally, Hey! Pikmin reveals that The President is older than Olimar, who is somewhere in his adulthood. The President is the the main source of mail in Pikmin 2 before the debt has been paid off, his news getting worse as he finds out that the lending agency he actually used was the All-Devouring Black Hole Loan Sharks, as opposed to Happy Hocotate Savings and Loan, and goes into hiding. After the debt is erased, Louie is left behind on the planet, and the President goes to help Olimar find him (albeit with the intent of collecting the planet's remaining treasure). When switching to him while playing after that, he calls himself "shacho", which is Japanese for "company president" (although it's commonly mistaken as "Schyaco", "Syecho", etc.). 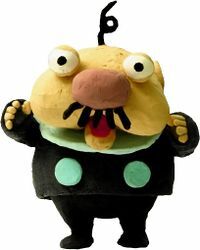 He becomes a playable character from then on, and permanently takes Louie's place as a Pikmin leader. His wife says in some pieces of mail that she is "the REAL boss" of the company. It is currently not known if she says that as an insult, if she is in fact the real boss, or a co-owner that works harder than the President does. Aside from Pikmin 2, the President is mentioned in Pikmin and Pikmin 3. In Pikmin, Olimar references him in various entries for ship parts and daily logs, in which he is simply referred to as "boss". In Pikmin 3, the President has more appearances than in Pikmin. He is seen in various different Data Files that explain controls and other mechanics. Oddly, he has a yellow suit in the files, where he has a black suit with a yellow backpack in Pikmin 2. He is also referenced in some of Olimar's logs. He also makes a cameo appearance as a snowman in the Distant Tundra, in which the nose is an Iron Ball which can be pushed out of place. He also cameos in Bingo Battle as the "Lucky Marble". In Pikmin 3, the President underwent another debt, and issued Olimar and Louie to grab more treasure while he stayed in vacation. 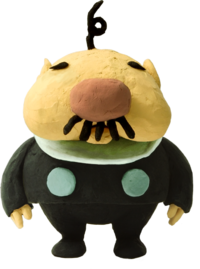 The President displays many of the same abilities of Olimar and Louie. His spacesuit consists of the suit he wore while on Hocotate (or one that looks identical), a helmet, and yellow gloves. His life-support backpack is also yellow, and his antenna bears the same blue light as Louie's. His whistle sounds more like a car horn than a regular whistle. The President appears as a trophy and a sticker in Super Smash Bros. Brawl. “The president of Hocotate Freight. After venturing into space in his youth, he made a shipping company. When it almost collapses after Louie's incident, and Olimar comes back from the Pikmin planet, the president discovers the outstanding value of Olimar's souvenir. He then sends his employees back to collect valuable treasures. His treatment of employees is questionable. The President's cameo on the Distant Tundra, from an early version of the game. The President as seen on the Exploration Notes. Note that this is the only depiction of him where he is colored yellow. 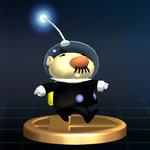 According to Olimar's voyage log, the President is in charge of the Pilot's Union, however it is possible that this is no longer canon as the President's character had not been fully established when this was stated. This page was last edited on March 18, 2019, at 20:22.